Need some additional room when holidaying or travelling? Want to better utilise your existing roll out awning? 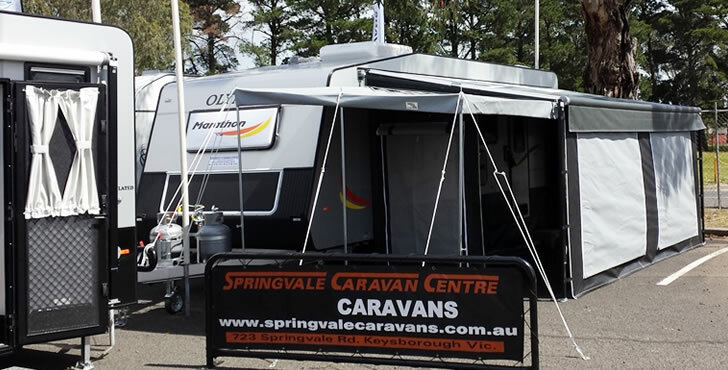 Springvale Caravans can has a great range of "Awning Walls" suitable for most roll out awnings. Call now for a quote on (03) 9798 3858. This photo shows our Premium Walls fitted with the optional front porch. Shown with optional clear window cover. Shown with optional rear verandah. Interior photo showing additional room obtained from sloped slide wall. Optional front and rear porch. Optional clear plastic window covers. A great range of colours are available which suit most roll out awning colours. All our awning wall sets are "Made to Measure" and are specific to your van. Need something special or different or not quite standard, just ask us or contact us via email.